Hiring the right CSRs is one of the most important steps for call center management to build a great call center team. Remember, agents are the only people on the call center team that have direct interactions with the customer! So, while it is important to make sure our call center team is properly trained for the client, we have to start by hiring the right agents. 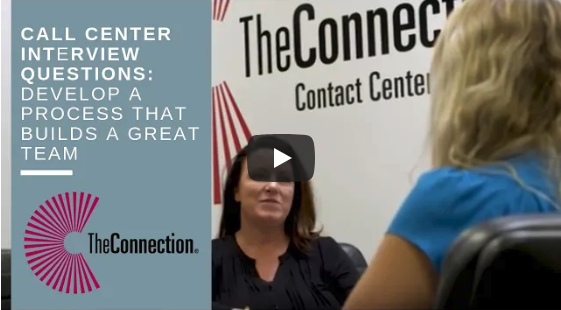 We sat down with our VP of Human Resources, Cyndi McDurmott, to discuss how The Connection® builds the perfect team. At this stage, it is important to weed out applicants who are not built for the call center environment. We do so by asking specific questions that, hopefully, paint a picture of each applicant’s strengths and weaknesses. We are looking for applicants who want to please and help people — those are the agents who will learn business-specific information and use it to provide the best customer support. Once the applicant passes the online application, they have to take some tests to prove their ability in various skills required as a call center agent. These tests could be a navigation test, typing test, etc. The tests we give to the applicant may depend on the needs of our client. Finally, we get to meet the candidate face to face! In this interview, we try to get a feel for how they handle conversations or react to unique situations that are likely to come up as a call center agent. Agents need to be able to think on their toes because they never know what the next customer may say! Assuming a candidate passed the first three prongs of our hiring process, they should be a great fit for our clients! A successful candidate can think on their feet, be proficient in typing and researching online, be a quick study in knowing the client they’re representing, and have clear dictation and strong conversational skills. There are many skills that can make an agent perfect for our clients and they vary on a case-by-case basis. But by having the right hiring process in place, we can ensure that only the best agents make it through to The Connection®. If you want to learn more or get some tips on hiring for yourself, contact us!